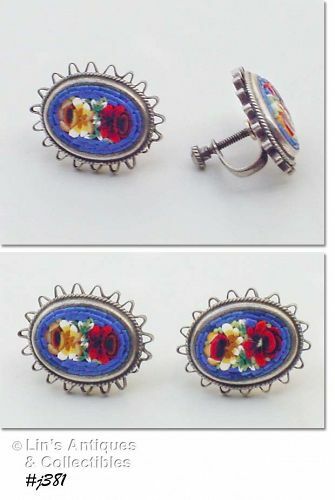 Beautiful mosaic earrings! Each has 2 flowers with green leaves and a blue border. They’re screw back style and are silver tone – I believe they are sterling but they are not marked. Absolutely gorgeous! 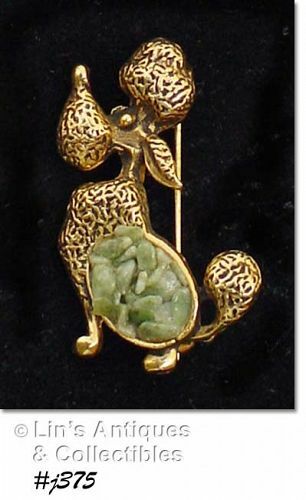 Cute poodle pin! It’s gold tone with black “antiquing” and the “body” has jade chips. Pin measures 1 ½” long (at longest), 1” wide (at widest), and is in excellent condition. 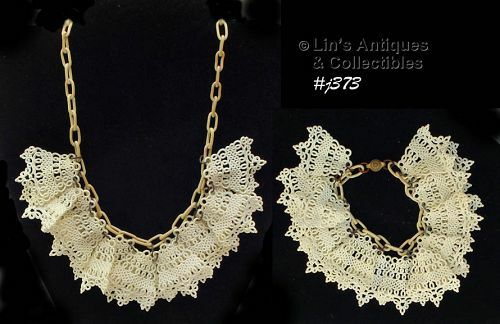 This is an eye-catching vintage necklace that has been in my jewelry collection for many years! 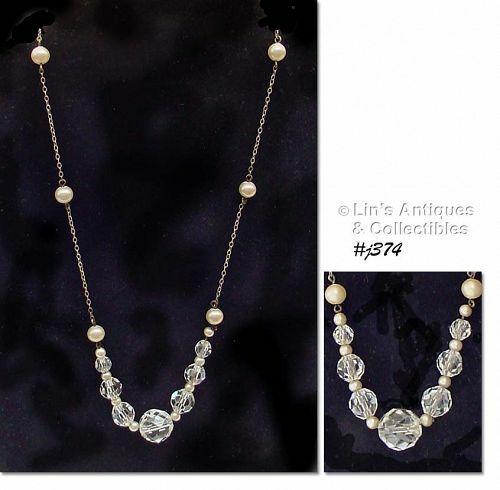 The 16" chain is sterling, there are 6 medium size faux pearls, and 7 faceted glass beads separated by smaller faux beads. The glass beads catch and reflect light beautifully! This is a gorgeous necklace that looks great with everything from casual to formal! This is a most unusual jewelry listing! It’s a necklace with matching bracelet made of Lumarith, a type of plastic produced by the Celluloid Corporation in 1937. The plastic is pierced to resemble lace. The bracelet measures 6 ¾” (end to end) and the necklace measures 15 ¼”. Super! 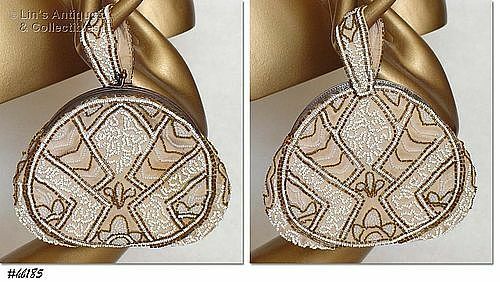 This is another lovely beaded evening bag! Inside has label “Made in France, Hand-made”. It’s in wonderful condition with beautiful beadwork. Excellent addition to a collection! 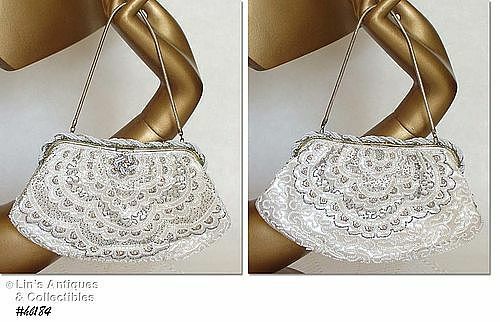 Absolutely beautiful beaded evening bag! It was made in France for Ed B. Robinson and it’s in wonderful condition. The only evidence of “use” is a couple marks inside bottom that look like pencil marks. This is an excellent addition to a collection – it’s outstanding! This is a neat and somewhat unusual item! 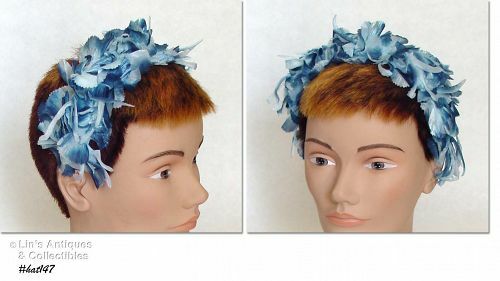 It’s a hair band that’s covered with silk flowers / petals. The petals are in pretty shades of blue. Appears unworn! 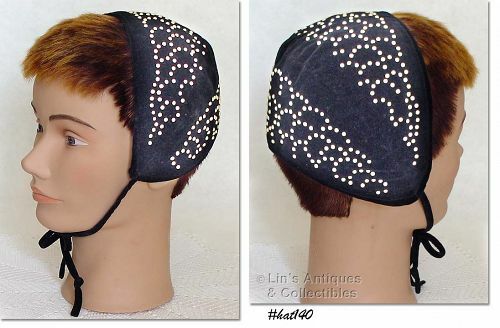 This is a wonderful collectible – a child’s (young girl’s) black velvet hat / bonnet! Please see photos to fully appreciate this lovely item. It’s difficult to photograph dark black hats and be able to see details so we lightened the photos a bit and the hat appears to be navy – it is not – it’s a rich, dark black. This is a neat hat! 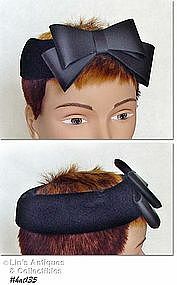 It’s a black velvet band style hat with an attached black double bow. Hat does not have a veil and there is no indication that it ever did. It would be very attractive worn as is or over a chapel/prayer veil. Label is: Kurli-Kutes, by Mel-Nat. Nice! 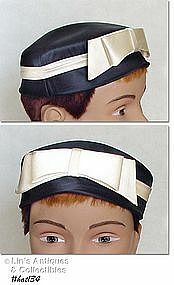 Excellent condition black hat with ivory color bow and band! Original labels indicate the hat was made by Luci Puci for DeJong’s, Evansville, IND. Lovely hat, appears unworn. 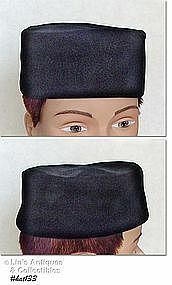 Extra nice black velvet pillbox style hat! Inside label has “by Cindy”. Still in the original box, this is Goebel’s 1978 First Edition ornament! 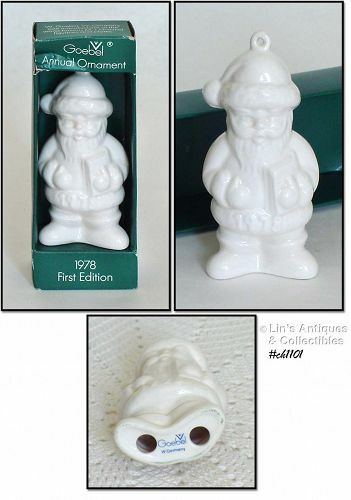 It’s a Santa that measures 4” tall and is white with a shiny glaze. Front of ornament has in-mold “1978”, bottom is marked Goebel, W. Germany. Ornament is in excellent condition, the box has minor storage evidence. Great collectible! 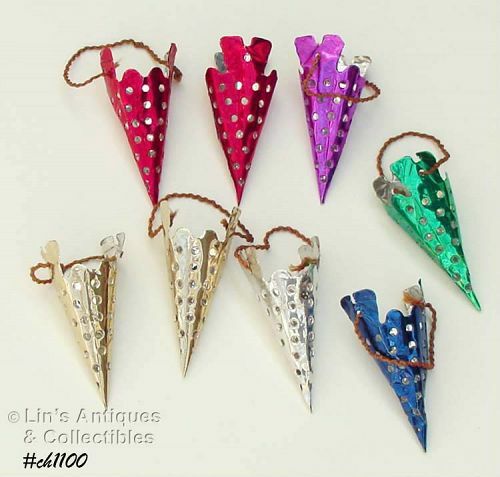 These cone shaped aluminum ornaments are so neat! There are a total of 8 in this listing – 2 red, 2 gold, 1 silver, 1 green, 1 blue, and 1 fuchsia. They measure 4 ½” long (at longest) and are in very good condition with minor storage evidence. One red cone is missing the hanging string (an easy fix). Super! 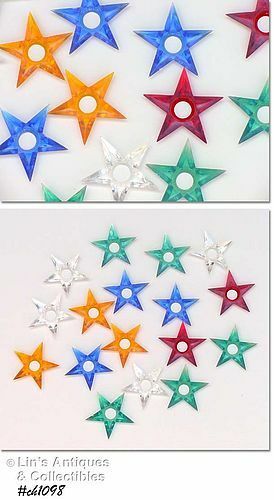 There are 17 hard plastic star shaped light covers/reflectors in this listing! There are 2 red, 3 gold, 3 blue, 4 clear and 5 green color ones. Super! 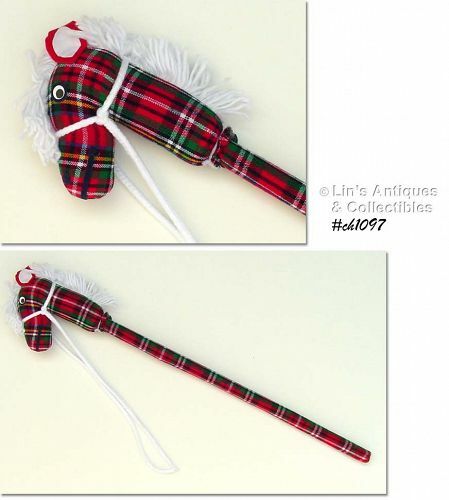 I purchased this neat stick horse at an estate sale in Indiana in the early 1990s! It’s new old store stock, is in excellent condition, and is nice and clean. This is an excellent cookie jar “part”! 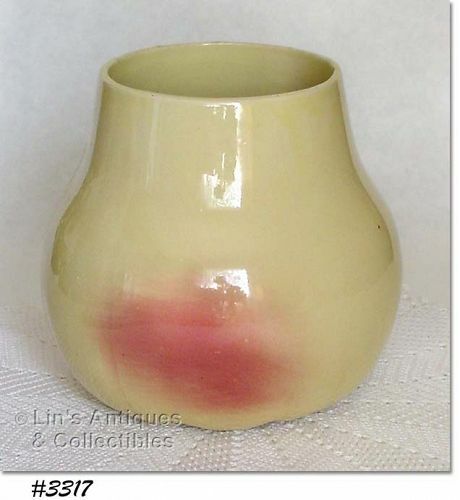 It’s McCoy’s pear cookie jar bottom and it has no chips, no cracks. Bottom is marked: McCoy, USA. 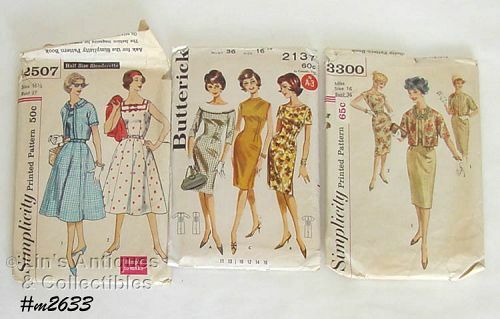 These are neat vintage patterns -- there are two Simplicity patterns and one Butterick! The Butterick pattern is size 16 (bust 36), one Simplicity pattern is also size 16 and the other is size 16 ½ (Half-size Slenderette)! They have been used/cut but carefully handled, folded and stored in original envelope. This listing has an Ivogue razor with celluloid handle, sharp and dull blade storage, and it’s in its own celluloid box! Razor has “Newark, NJ” Pat. Pend. 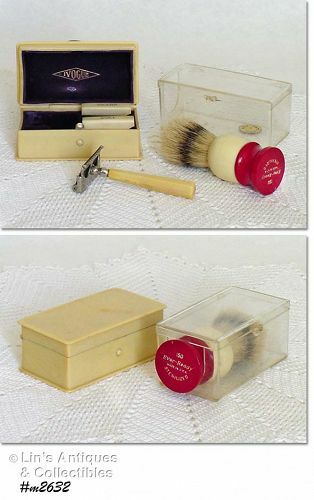 The shaving brush is probably made of boar hairs (sheds a little) and it’s still in the original box. Neat items!